SEMPER FIDO: A boy learns how to be a man from a dog in Yakin's attempt at a canine version of American Sniper. Last weekend will go down in Hollywood history as the one that brought us films about a foul-mouthed teddy bear attempting to reproduce and a heroic Marine dog with post-traumatic stress disorder. While Ted 2 plays its anthropomorphized protagonist for laughs, Max encourages us to shed tears over the nobility of Max the Malinois, a loyal soldier who never actually chose to enlist. While this canine thespian is undeniably endearing — especially when he plops his snout on his paws and does that "mournful gaze up at his master" thing — his story can be tough to take seriously. Director Boaz Yakin (Safe, Remember the Titans), who wrote the script with ex-Marine Sheldon Lettich, milks reactions from the audience by hitting all the standard dog-centric family-film beats. Yet, from time to time, hints of a smarter and more complex film peek through. We meet Max in Afghanistan, sniffing out illicit weapons caches with a battalion of Marines. After an ambush traumatizes the dog and results in the death of his handler (Robbie Amell), the Marine's grieving mom (Lauren Graham) steps in to save Max from euthanasia. "This family takes care of its own," she growls in an unconvincing salt-of-the-earth accent — then proclaims Max the sole responsibility of her younger son, Justin (Josh Wiggins). A surly teen with a propensity for slacking and shirking might seem like an odd choice of caretaker. But maybe even Mom has sussed out that this is Justin's coming-of-age story, in which he will tend the dog's invisible wounds and grow out of his bad attitude and disdain for the military heroism of his dad (Thomas Haden Church) and late brother. Sure enough, with the help of a cute girl who's watched lots of Cesar Millan (Mia Xitlali), Justin coaxes Max back to tractability. Just in time, too, because this red-blooded family needs the dog's aid to survive a complicated plot involving a no-good former member of Max's battalion (Luke Kleintank) and a drug cartel. Strong performances from both the kid and the dog (or dogs — a light-faced Malinois named Carlos did the close-up honors) make this programmatic story watchable. Fans of Old Yeller and its ilk are bound to tear up as Justin's bond with Max strengthens. The script has its welcome moments of subtlety, too: While Justin's mom is a flag-waving stereotype, his dad's memories of service pose tough questions about the meaning of wartime sacrifice. Justin's best friend, Chuy (Dejon LaQuake), is Mexican American, and the script occasionally raises issues of ethnic stereotyping and prejudice in organic ways. Of course, that same script typecasts Chuy's cousin as a conveniently villainous trafficker in illicit goods. Yakin seems to be going for a Spielbergian suburban-kids-unbound vibe in the action climax, which uses dirt bikes and a forest setting in ways reminiscent of E.T. the Extra-Terrestrial. But the sequence lasts so long that it becomes more tiring than exuberant. 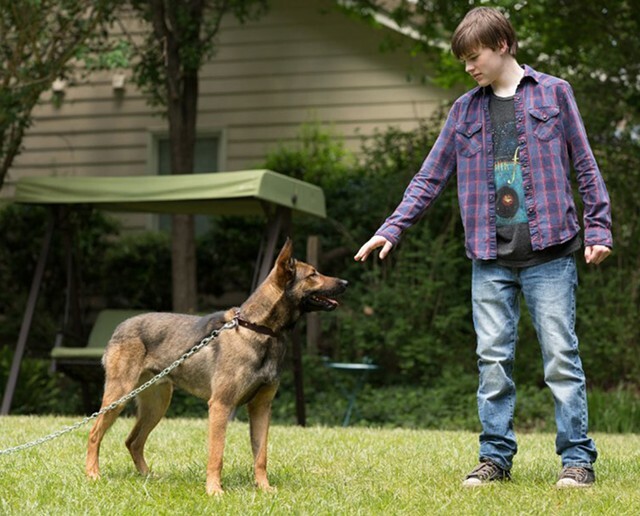 At its core, Max is still the sort of movie in which a dog paws at his late master's casket and can instantly tell good guys apart from bad ones — that is to say, a movie that forgoes a more real, raw treatment of the human-canine bond in favor of a sentimental one. There's a heartbreaking film to be made about a war dog that doesn't speedily recover from PTSD, a film that does more than touch on the ethics of sending animals into battle zones. This ain't it. Those adult reservations aside, many younger viewers will love Max — who, unlike the Benjis of this world, has some of the unruly energy of a real dog to go with his winsomeness. And if I had to hang out with either the personable shepherd or the leering teddy bear, I know which I'd choose.